This month, we’re introducing “Print Peeks,” a regular feature examining select items from our print collection. Did you know that The Texas Collection has more than 167,000 books and more than 3,000 active serials titles? And that does not even get into our vertical files and other material types. Our first entry looks at one of our Texas newspapers. Enjoy! From 1892 to 1901, the Artesia was a popular Waco newspaper with a circulation of over 2,500 at its height. As a society paper, the Artesia focused its coverage on social events and comings and goings of Wacoans. A typical issue included columns titled “Happenings of the Week—Movements of People You Know,” with items on the Shakespeare Club, the ladies of Waco organizing the parade for “Street Fair Week,” and reports of the local dinner parties with a list of interesting visitors from Houston and San Antonio. The paper was founded by a prominent member of the Waco Jewish community, Isaac Goldstein, and thus featured more activities of Jewish organizations of the time than did other papers. Goldstein, along with Louey Migel, owned a successful department store in Waco. Not surprisingly, Artesia’s pages were full of advertisements proclaiming the latest fashions and their availability at Goldstein-Migel. Vital to the Artesia’s publication was Kate Friend, who served as editor. Along with her duties at the paper, Friend was an authority on Shakespeare and an advocate for animal rights, even speaking on the subject in Washington, D.C., in 1935. This Easter edition of the Artesia was published on April 15, 1900, and the content is typical of the publication. Notes from recent club meetings and social gatherings fill all four pages. However, the front and back covers are far from standard. 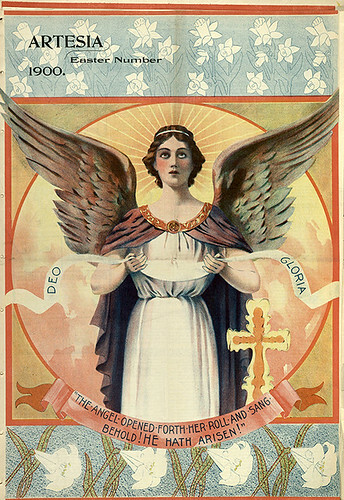 The front cover (see above) features a powerful image of an angel, standing with purpose and eyes fixed upward. The mix of soft Easter pastels with a vibrant red and yellow background is striking. 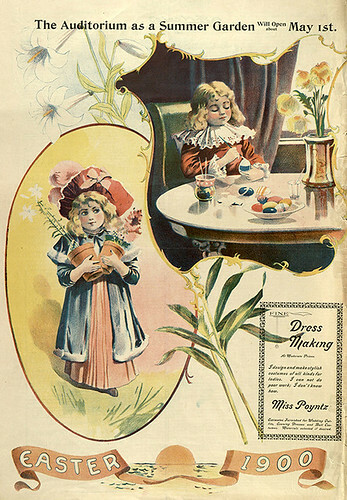 The back cover (to the left) includes festive scenes of children holding flowers and coloring Easter eggs. At the top is an advertisement for the Auditorium as a summer venue for people to come and enjoy the warmer weather. This seems to be a reference to the Auditorium Theater which, according to the 1900 Waco City Directory, was built at the corner of 6th and Columbus and had a seating capacity of 7,000. At the bottom of the page is an advertisement for the self-assured dress maker Miss Poyntz, who proudly claims that “I can not do poor work; I don’t know how.” Both advertisements seem to be well timed as Waco began to anticipate the summer and upcoming social events. The artwork featured in this edition of the Artesia is not only beautiful but provides the modern reader with a window in which to view holiday traditions that are more than a century old. Interested in learning more about the Artesia? We believe we have the full run of the paper, which you can come and peruse in our reading room…among many other newspapers, Texas and otherwise!